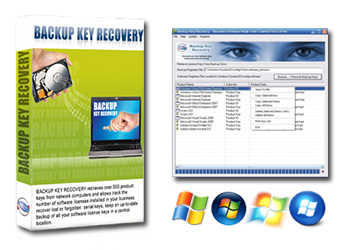 Backup Key Recovery retrieves product keys for Windows, MS Office, SQL Server, Adobe products and more than 4500 popular software products installed on your old hard disk drive. With Backup Key recovery you can recover lost product keys for all major software programs, prevent losing your investment and money! Excellent tool for system administrators and computer repair service providers. With Backup Key recovery you can recover more than +4500 popular software serial numbers. Backup Key recovery is the easiest to use toolkit on the market. Excellent tool for computer repair service providers. We offer attractive discount prices for Multi-User Licenses. "Thank you for creating such a nice tool. Backup Product Key Recovery saved me time and money. It was easy and fast. Thanks a lot..."
"Your program Backup Key Recovery is Must-Have software for computer repair technicians and computer repair service providers, we're really impressed! "I have run a scan on my network using Backup Product Key Recovery and am happy with the results"